Do I need to be a Buddhist to visit the Center? Not at all! We'd love to meet you. Is it ok for me to attend events, even though I have little or no experience with Buddhism? Absolutely! At every event there are a good number of people who are meditating, or listening to teachings or receiving empowerments for the very first time. In fact, we all began with no experience! Everyone begins at their beginning. What types of people are welcome at the Center? 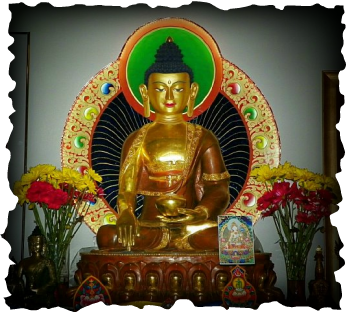 We are an open and inclusive sangha, and do not discriminate on the basis of race, ethnicity, gender, income, sexual orientation or political orientation. We are a very diverse group of folks, with members from many walks of life. Can I help out in any way? Oh yes! Like most Dharma centers, volunteer help is the life and breath of RigDzin Dharma. You can help by making donations of time, needed supplies, or through financial support. Check our Volunteer Info, or our Support Us pages to learn more. Is there work-study or financial assistance available? Yes, limited work study is available. Please call or email to learn more. Are children welcome at your events, meditations and practices? Children are always welcome to our events if accompanied by an adult. Why do you practice together as a group? Venerable Traga Rinpoche explained the benefits of group practice at the Center. "The [RigDzin] Center has been blessed by great masters and contains many images of Buddhas, whether in statues or thangka paintings, that have been blessed and empowered. Practicing in a location like this helps our practice to become more powerful. Also, when you practice in a group you obtain more merit. For example, if you do 100 mantras on your own, you just do 100 mantras. When you practice in a group, you do 100 mantras multiplied by the number of people in the group." Why do you ask for donations? Running a Dharma center and putting on teaching events involves considerable costs, from general operations and mortgage, to plane fares, translator fees, donations to the lama(s) meals and so forth. At RigDzin Dharma we make every effort to structure our special events so they are affordable for everyone. That is why we have a sliding scale. Our intention is not to make money, but to at least break even at the end of each year! Also, please keep in mind that no one is ever turned away because of inability to pay. Should I bring my own cushion? We have a variety of seating options available at RigDzin Dharma Center—zafus, zabutons, pillows, and comfortable chairs. But if you would like to bring your own cushion you certainly may! Do I need to sit perfectly still? In the tradition of Buddhism found at RigDzin Dharma, it's not necessary to sit perfectly still in order to participate in meditation or other events. Our minds should be relaxed and fresh. If you need to shift your position to become more comfortable, please do! We are located in the Nob Hill district of Albuquerque, at 322 Washington Street SE. For specific directinos, please visit our Maps, Directions, Etc. page.